Ask 100 people to describe to you their ideal hamburgers, pancakes, cinnamon buns, etc., and you will most likely get 100 different opinions some of which are entirely incompatible and all of which are subjective. But isn’t that the way it is with pretty much everything in this world? How, then, can we evaluate all these opinions and decide which one(s) we should allow to influence our position regarding the issue at hand? Personally, when it comes to matters in which there is no clear right or wrong, I often find myself influenced by people who can aptly, logically, and eloquently outline the reasons behind their position. This is why it’s kind of sad that some valid opinions in this world are dismissed because they are ineptly presented, oftentimes with the underlying belief that the louder or insistent one is, the more authoritative and, consequently, the more convincing one appears. I’m not sure how aptly, logically, or eloquently I can state the reasons for my intense like of these dinner rolls. My guess is – not much. But would you kindly allow me to try anyway? White or, at the most, half white half whole grain. But equipped with long, strong gluten strands that result in some chewiness. Crustier than Wonder bread, but certainly not to the degree of artisan bread which requires a strong serrated knife to saw through. Yet strong enough to allow you to use them to mop up thick sauce and gravy without falling apart. Not sweet. I’ve had and made several dinner rolls that taste almost like dessert rolls. Several of the recipes for “best dinner rolls ever” on some recipe sites yield this type of rolls. And, apparently, based on the glowing user reviews, people like them. So I guess I’m in the minority here. 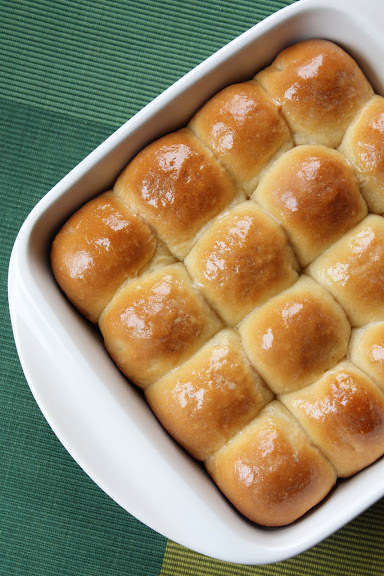 I think dinner rolls should not be sweet; their flavor should complement, not interfere with, the savory entrée(s) with which they are served. Not too buttery or eggy for the same reasons as the previous point. These dinner rolls fit the aforementioned description. One added benefit is that they are very easy to make. Forget that whole soaker and biga thing; just dump all the ingredients all at once into your stand mixer bowl or a mixing bowl and mix with the machine or manually. It’s one of those things that exist to prove that cheap, easy, and seemingly unsophisticated are not to be sneered at. Mix together, with a machine or by hand, 1 1/4 cups lukewarm water, 1/4 cup nonfat dry milk powder, 2 teaspoons active dry yeast, 1 tablespoon sugar, 1/4 cup (56 g) butter (softened), 1 1/2 teaspoons salt. Gradually add in enough of King Arthur bread flour (the only flour I use for this recipe — if you have it, use the best bread flour you can find in your locale) to create a ball of dough that is not so sticky that you can’t knead it, starting with 3 cups. Add more flour as you go, as needed. Knead until the dough is satiny smooth and when you stretch it out, it forms almost translucent “gluten window” without tearing apart. Transfer the dough to a greased bowl and let it rise, covered, in a warm place until doubled in volume, about an hour. Deflate the dough gently and form it into 18 balls. Place them side by side in a greased ceramic or glass pan (10-inch in diameter or 8″x8″), cover, and let rise in a warm place for an hour. Bake at 350° F for 40-45 minutes or until the tops are brown and the rolls sound hollow when tapped. Did I convince you? Or did I fail? 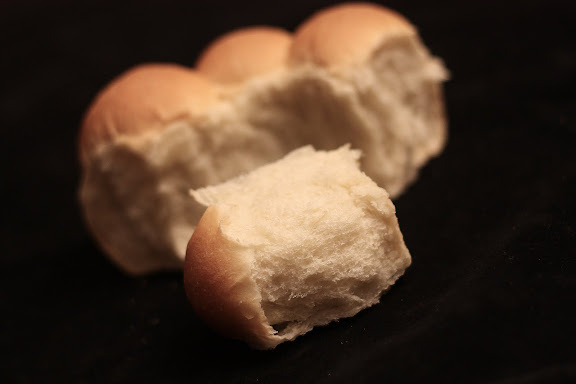 How would you describe a perfect dinner roll? Those look pretty good to me! I like my dinner rolls very soft with a buttery crust. To that end, I brush the rolls with butter before AND during baking. 🙂 I do loves me some butter! Soft and fluffy! So this is how old fashoioned dinner rolls should be! I definitely don’t want sweet bread with my dinner, so your version sounds good. I wish it was possible to achieve this beautiful stretchiness with a gluten free flour! Yum!! Nothing like a warm dinner rolls with a spread of butter. I love the nice rounded shape of the top crust. The first picture sort of reminds of of monkey bread from the way they’re grouped together. I’m going to have to differ from you here. For me the perfect rolls are whole wheat Fresh from the oven with melted butter and honey – oh wow, you are bringing back memories. My mom and grandma made them, and I have too (won grand champion in the State Fair, thank you very much) but they were so light and fluffy and tasty – just about perfect. We ground our own wheat and I think the secret was that we let them rise twice. Aside from that small difference, I’ll thumb wrestle you for the last roll, because you had me at roll. wow the texture looks perfect! I am with you, I like them soft! You convinced me!! While I do prefer the buttery variety with a hint of sugar, not too much, though, I would try these rolls in a second. Lovely photos. Thanks for a great recipe. Bookmarked! I love the way you describe these dinner rolls. That’s how I personally decide whether or not to try a recipe. I am totally going to try these. Thanks for sharing! all of your descriptions are my idea of an ideal dinner roll! these rolls look great almost like pan de sal which are truly my favorite roll. These look so good! Anything I can substitute for the milk powder? Hi Tanya – Thanks. You can replace the water with the same amount of evaporated milk (which is more concentrated than regular milk without being as rich as half-n-half or heavy cream) and forget the milk powder. You can use this trick in any bread recipe that calls for milk powder. Those rolls look just perfect! All you needed to do was show me that picture of the one you pulled off of the loaf to convince me! These seem very much like my grandma’s rolls. There was, of course, no recipe, but we did try to measure as she went along once in an attempt to get a ballpark estimate. Two slight differences- half the batch always got a extra dollop of butter after coming out of the oven. And those were the ones we used for jelly and jam. Second, there was no gentle deflating after the first rise. The real secret ingredient? Whichever kids were around got to punch down the dough ball; we took punch literally. We also got to make a number of mini rolls, about the size of our thumbs to fill in any gaps in the trays. Thanks for this one. I would like to make some today. I like this one served hot with butter on the top. These rolls really do look like the Platonic ideal of a dinner roll . . .
Ah, I tried making them today and failed utterably…. Will try again tomorrow! Any tips? It’s cold at the moment, so the ‘warm place’ I put the dough was an oven that was heated to the lowest setting for 3-5 mins then switched off. The bread was crispy on top and didn’t really rise in the oven. The inside was soft but not fluffy and the bubbles left inside were fairly big compared to what I see in the picture. Thank YOU! for a recipe that’s not sweet. I was searching all over.